History was created, as the sea side temple in rock carvings stood testimony to fact the that UPS DAY was celebrated with gaiety and much fanfare at the scenic sea side resort of GRT TEMPLE BAY at Mahabalipuram. 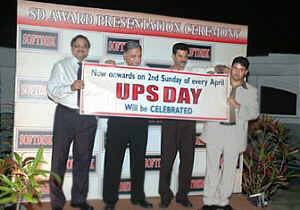 UPS Manufacturers across the length and breadth of the country gathered to make the occasion of UPS DAY launch, a grand success. The enthusiasm shown by the UPS fraternity has made our will stronger to make the UPS DAY, a celebrative and a repetitive affair. In 2008, we will celebrate it on 13th of April in some Northern location. 14th continuous year of transparent journalism. Numeric are the SD’s No. 1 Power Electronic Company of the Year. SD’s No. 1 Online UPS Manufacturer of the Year and also SD’s No. 1 Line-interactive UPS Manufacturer of the Year. The company’s product were also adjudged the Best Online / Line Interactive UPSs for all ranges for Product quality & After Sales Service in SD’s Users’ Satisfaction Survey 2006.
to Mr. R Chellappan, Mr. Balan, Srini & Babu of Numeric, Chennai. DB POWER ELECTRONICS PVT. LTD. PUNE. DB are the SD’s No. 2 Power Electronic Company of the Year and also the SD’s No. 2 Online UPS Manufacturer of the Year. The company was also adjudged best Online UPSs in Product quality for all ranges in SD’s Users’ Satisfaction Survey 2006.
the award to Mr. H N Sayed GM Marketing, DB, Pune. Aplab are the SD’s No. 3 Power Electronic Company of the Year and SD’s No. 3 Online UPS Manufacturer of the Year. The company has also been adjudged best in Product Quality for Online UPS Systems upto 60 kVA. & Ranked 2nd in terms Product Quality and After Sales Service in SD’s Users’ Satisfaction survey, 2006.
the award to Mr. S A Joshi, Executive Director APLAB, Thane. UNILINE ENERGY SYSTEM PVT. LTD. NEW DELHI. Uniline are the SD’s No. 5 Power Electronic Company of the Year and SD’s No. 3 Offline / Line interactive UPS Manufacturer of the Year. The company has been adjudged with “A++” Ratings in SD’s Users’ Satisfaction survey, 2006.
the award to Mr. R K Bansal, MD Uniline. HI REL ELECTRONICS PVT. LTD., GANDHI NAGAR. Hi-Rel are the SD’s No. 7 Power Electronic Company of the Year and the company is also rated “A++” in SD User Satisfaction Ratings 2006. BEST POWER EQUIPPMENTS INDIA PVT. LTD. NOIDA. BPE are have won the coveted SD’s No. 8 Power Electronic Company of the Year award and is adjudged Best in After Sales Service for Online UPSs upto 20 kVA in SD User Satisfaction Ratings 2006.
the award to Mr. Amitansu Satpathy, of BPE, Noida. POWER ONE MICRO SYSYTEM (P) LTD. BANGALORE. Power-One are the SD’s No. 9 Power Electronic Company of the Year and ranked 4th in terms Product Quality and After Sales Service in SD’s Users’ Satisfaction survey, 2006. TECHSER POWER SOLUTIONS PVT. LTD. BANGALORE. Techser are the SD’s No. 10 Power Electronic Company of the Year & the company is also ranked 5th in terms Product Quality and After Sales Service in SD’s Users’ Satisfaction survey 2006.
the award to Mr. Narayan Sabhahit, MD Techser, Bangalore. SD’s 2nd largest Line Interactive UPS Manufacturer in the country this is however in revenue terms however in unit terms they are the largest manufacturer of Line interactive UPSs in the SD Award Survey 2006. The company has been adjudged with “A++” Ratings in SD’s Users’ Satisfaction survey, 2006. Mr. Ramdinsangha Saiawi, Marketing Head, WeP Peripherals, Bangalore. ELECTRONICS ENTERPRISES (Elent) NEW DELHI. SD’s No. 1 CVT Manufactuirer of the year. The company has been adjudged with “A++” Ratings in SD’s Users’ Satisfaction survey, 2006. Mr. Mukesh Singh, Director Elent Eletronics Pvt. Ltd., New Delhi. EATON’s POWER QUALITY PVT. LTD., NEW DELHI. Eaton has been rated best in SD Users’ Satisfaction rating for product quality of online UPSs upto 20 kVA and adjudged best in providing After Sales Service & End-User Education for its entire range of products. Mr. A S Ravishankar, Zonal Manager (South & West) Eaton New Delhi. DELTA ENERGY SYSTEMS (I) PVT. LTD. GURGAON. Delta has been adjudged the Best in SD Users’ Satisfaction rating for product quality of online UPSs above 60 kVA. & Best in providing After Sales Service for its entire range of products. to Mr. Somnath Singha, Country Business Manager Delta, Gurgaon. MICROTEK INTERNATIONAL PVT. LTD. NEW DELHI. Microtek has been adjudged Best in SD Users’ Satisfaction Survey for Offline/Line Interactive UPS Systems with “A++” ratings. the award to Mr. Sandeep Mathur, VP Marketing, Microtek, New Delhi. 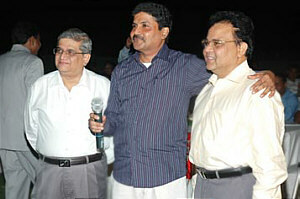 HITA TECHNOLOGY PVT. LTD., KOLKATA. Hita has been adjudjed Best in SD Users’ Satisfaction rating for product quality for Online & line-interactive UPS systems. The company has been adjudged with “A++” Ratings in SD’s Users’ Satisfaction survey, 2006.
the award to Mr. Rajan Babu, Regional Manager (South) Hita, Kolkatta. SU-KAM POWER SYSTEMS LIMITED, GURGAON. Su-kam from Gurgaon has made rapid strides and has been adjudged with “A++” ratings in SD’s User Satisfaction survey, 2006.
the award to Mr. J Ganesh of Su-Kam Power Systems Ltd. Gurgaon. Powertronix has been adjudged having A++ satisfaction levels and enjoys a very high rating in After Sales Services in SD’s user Satisfaction survey, 2006. Mr. Ramesh S, Chairman & CEO, Powertronix, Bangalore. AURO has been adjudged having A++ satisfaction levels and enjoy a very high rating in PRE SALES END USER EDUCATION in SD’s user Satisfaction survey, 2006.
the award to Mr. Suresh Srinivasan of Auro Power, Chennai.